Women’s Work! 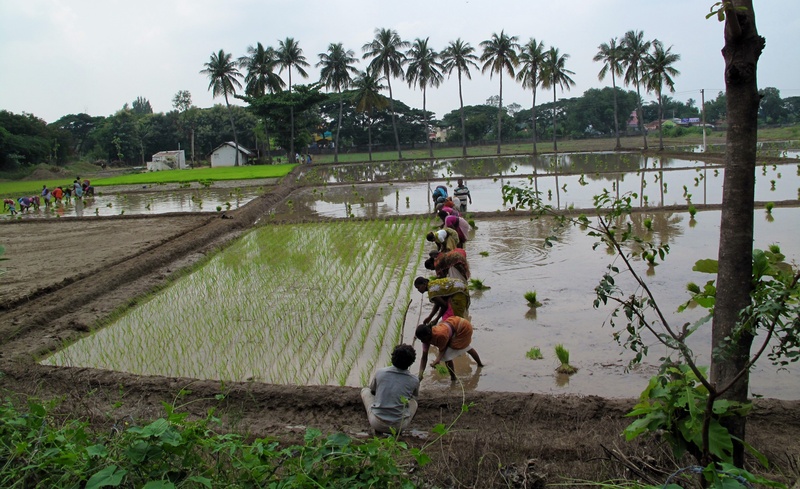 Back-breaking work taken on by agricultural labourers. First the earth had to be prepared, the rice planted in a nursery field and nurtured until robust young seedlings heralded forth with Pachamamma’s superlative expression of self-confidence. Pacha happens to denote the colour green in Tamil – another nice touch for this blog! The idyllic family farm house is just beyond the nursery paddy field. There are huge machines for harvesting clunking along highways and back roads with motor-bikes strapped to the sides like insects caught in a web – men’s tools for men’s work; but there are no machines for this work; it has to be done by the hands of women. There’s something very reassuring about this. Notice there’s a man squatting at each end of the line, holding the guide straight. 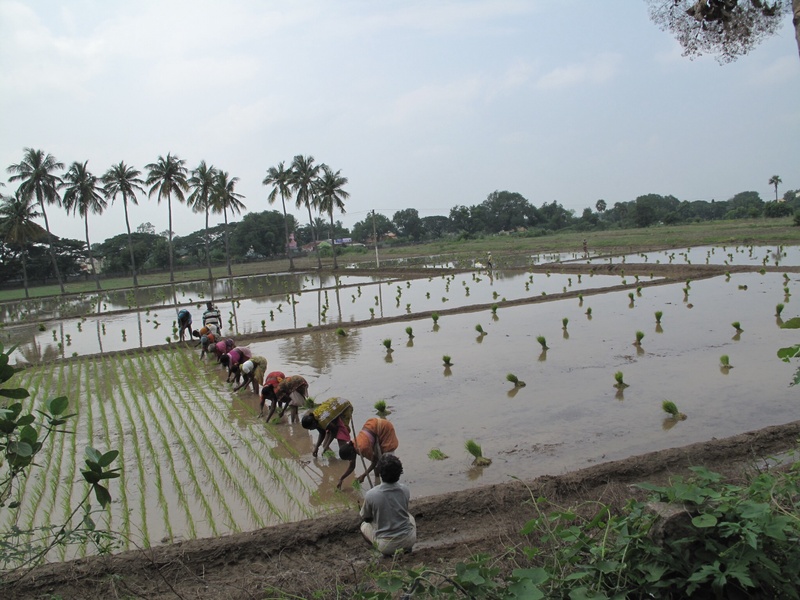 The men take it on themselves to count the seedlings grouped into bundles and the women to plant small groups of a few seedlings in the mud below water level. All the bundles wait while the women work their way patiently towards them through the day. In the old Sangam poetry the tradition was for men to do all fieldwork however here, now, practices have changed. 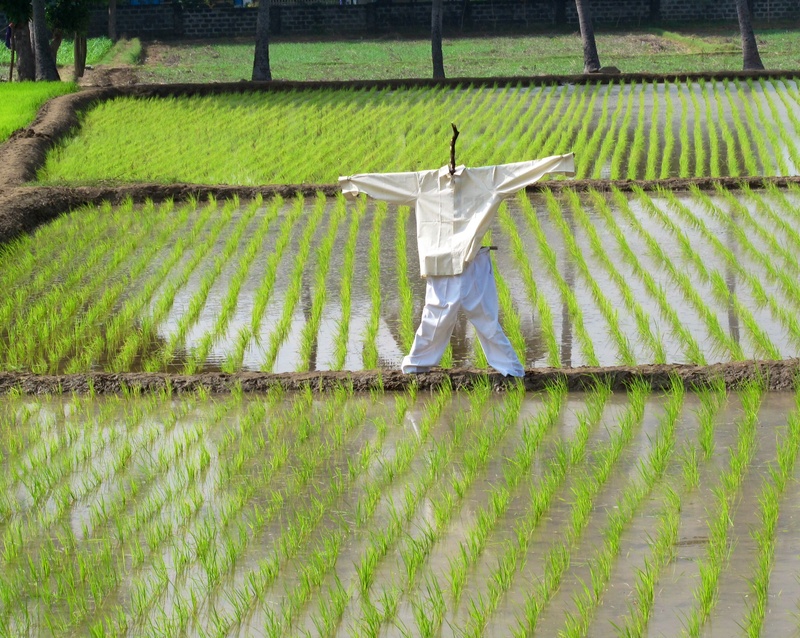 ScareCrows are always male. This one looks like an ashram inmate. 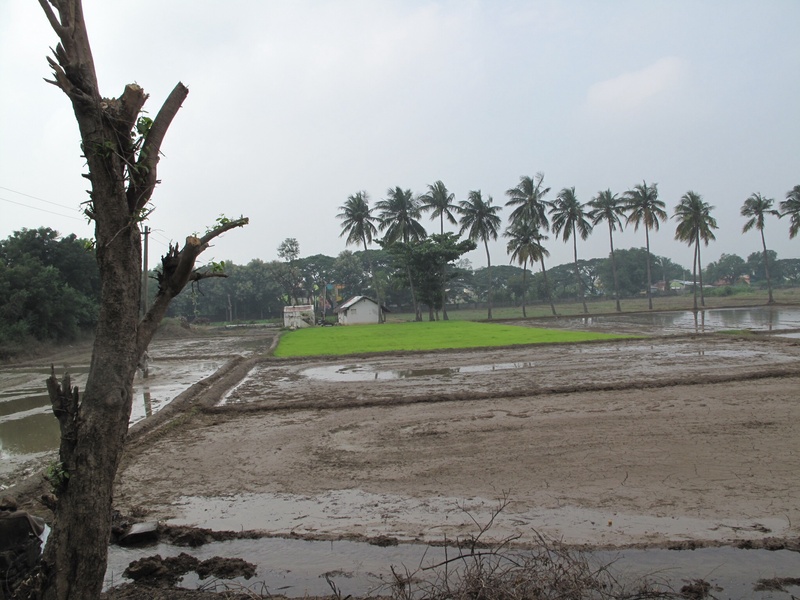 This evening I notice there remains quite a sizeable field of paddy seedlings as yet planted, and several fields not yet prepared. In the coming month before I leave for my native place, the progress of these beautiful fields will be recorded. Three days’ time enhances the filming view of greenness. Looks the ScareCrow is active. This photo was taken on my birthday December 22; next year let us see! Thanks for photos and review. I went up to photograph the faces of the planters this evening but I missed them. Notification of your comment came jingling through just as I posted the last images. Nice. Good post; just seeing the process. Won’t be able to see it the whole way through though since I leave in a month. But it’s beautiful.